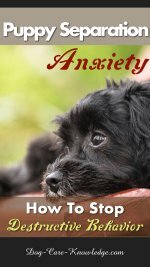 The easiest way for trimming dog nails successfully, is to do it in a way that doesn't upset your dog. Easier said than done I know, but that's why I've put together these tips to help you on your way. Before we get started, it's also useful to know that getting your pup used to having his nails trimmed as young as possible will be easier for him and you in the long run. Short nails are less bothersome to dogs and will save your hardwood floors from scratches and your carpets from being ruined. Leaving your dogs' nails long can result in painful ingrown nails, nail breakages, infection, an uneven gait and possible skeletal problems. All of which can be avoided just by learning to trim your dogs nails. Also, by practicing some good grooming techniques for trimming nails you can clip your dogs nails without hurting or stressing your dog, or you for that matter. It is much easier to see the quick if your pet has white nails rather than black. Trim the nails to about one-eighth to one-quarter inch from the quick. If your dog only has one white nail, trim it first to use as a guide for the others. If they're all dark, trim the nail level with the pad or just past the nail hook. Remember to trim the dewclaw on the inside of your dog’s leg too. In order to recede the quick and leave your dog's nails permanent short, you need to trim your dog's nails at least twice a month. Having said that, the need for regularly trimming dog nails will differ for all dogs. 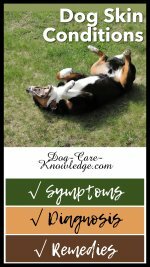 Nail trimming for dogs that have a lot of activity on hard surfaces, may not be necessary as they wear their nails down more so than dogs that stay indoors or just run on grass. If the dogs' nails become too long it can cause the toes to splay and prevents the foot pads from making contact with the ground. When you are ready to begin the task of dog nail trimming, make sure that you first have the proper tools. It is important to use nail clippers designed for pets. Never use clippers for humans, as this may lead to future complications. If your dog is a wriggler, ask someone to hold and comfort him during the clipping. Keep the treats nearby and the first aid supplies in case you cut into the quick and cause bleeding. 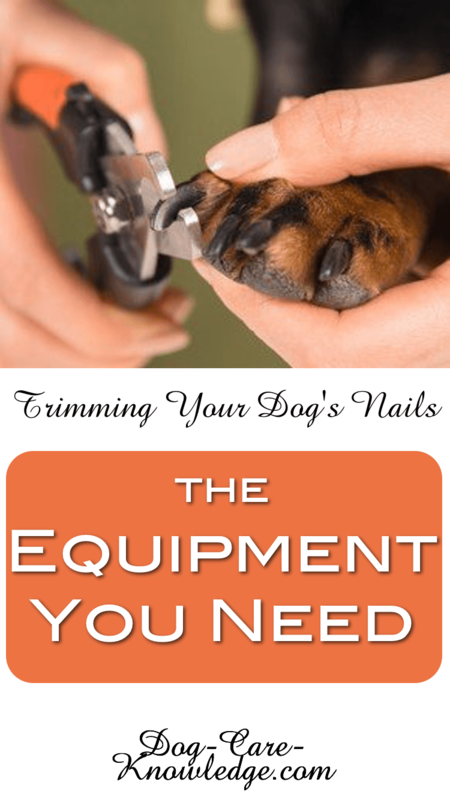 Once you have these items and your dog is situated, you are can begin dog nail trimming. There are four basic clipper types available: guillotine style, plier style, scissor style, and Pet-icure, which work like a razor. You'll also need a nail file (for dogs) to file the nails smooth after clipping. 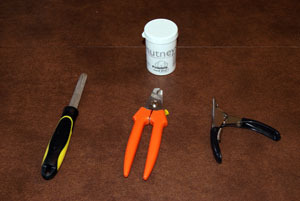 I have used most types of clippers and much prefer the plier style (the ones with the orange handle in the picture above). Use whichever type you are comfortable with but make sure you have the right size for your dog. MIller's Forge have a great range and are the groomers choice. See here a great detailed video on how to locate the quick and cut the nails properly. The thing most owners worry about when trimming dog nails is cutting the quick. I'm sure you've heard the saying "cut to the quick", well, this is where it comes from! The quick is the pink fleshy tissue below the nail where nerves are located and it bleeds and hurts a lot when cut. By making many small gradual clips to the nail you will limit your chances of cutting the quick. But, sometimes, stuff happens, so if you do accidentally cut the quick a good product to use to stop the bleeding is 'styptic powder'. If you don't have that handy you can use cornstarch or even flour will do. If you are going to be cutting your dog's nails on a regular basis, I would invest in some Remedy and Recovery Styptic Powder. It's not that expensive and works super fast. Place your pooch in a position that is comfortable for them while you clip. If he is wiggling and squirming, ask the person holding him to change the grip so he holds still for his nail clipping session. I find it makes it much easier when trimming dog nails if you cut a small bit off at a time, rather than the whole lot at once. It puts less pressure on the nail and reduces the risk of cutting the quick. If your dog really hates having his nails cut then just do one nail a day until he learns to accept it. Once you have trimmed the nails, finish off by using the nail file to smooth any rough edges that could get snagged. Trimming dog nails is easier when you do it once or twice a month. 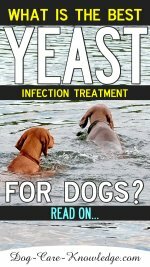 If trimming dog nails is done twice a month, the quick will recede leaving the nail permanently short. Although it may seem a daunting task for owners, most dogs would prefer their owners to carry out the task rather than a groomer as they will feel more secure. Keeping your dog comfortable during grooming sessions adds to his feeling of security and well-being. Keep a treat to distract him during the process and reward him after each nail and then again at the end. Show lots of affection after trimming dog nails to remind your four-legged friend how much you love him. Then go and give yourself a treat, you deserve it!